We are excited to announce that Berea has been chosen for the THIRD time by the Mortimer & Mimi Levitt Foundation to be one of 18 cities in the US to be the home of TEN FREE outdoor summer concerts. 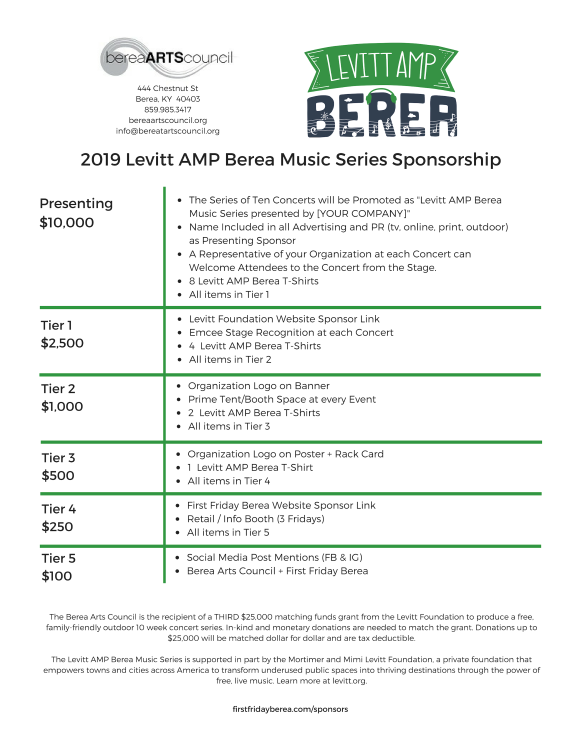 The Levitt AMP Berea Music Series takes place on Friday evenings, July 19 - Oct 4, 2019 in the Old Town Artisan Village. The AMP Berea Partnership formed in 2016 to apply for a $25K Levitt Foundation Matching Grant to expand entertainment and community building activities. The Berea Arts Council, First Friday Berea, and City of Berea Tourism invite you to help us make these events a success. Your financial and in-kind support goes directly toward our grant match requirement. We are launching an extensive marketing and community relations campaign. Promote your business to residents and visitors. Choose one of our sponsorship tiers or allow us to customize an advertising package that's right for you. We also have volunteer and outreach positions available for your team to engage with community. Your generous support is managed by the Berea Arts Council, a charitable 501c3. Please reach out to schedule an in-person meeting or to ask questions. 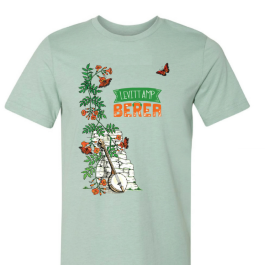 With your help, the Levitt AMP Berea Music Series will grow and play an integral part of a strong, thriving Berea!